Mann Library garden certified by ‘green’ landscape system [Cornell Chronicle 9/25/2012] – The garden space flanking Mann Library’s front door is one of only 11 landscapes in the country to be certified by the Sustainable Sites Initiative (SITES), a new “green” certification system for landscapes. The 5,000-square-foot entrance garden was site-assessed, designed and built by students in the 2009-10 in Creating the Urban Eden, a yearlong course co-taught by Nina Bassuk, professor of horticulture, and Peter Trowbridge, professor of landscape architecture. Read more about the Mann landscape at the SITES website. 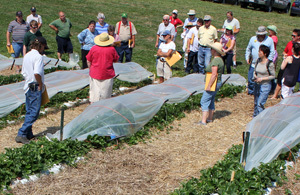 Growers view low-tunnel everbearing strawberry production system that extends the harvest season and protects against frost. Berry open house features new options for growers [Cornell Chronicle 9/24/2012] – Despite a tough year for New York’s berry growers, more than 80 from attended the Small Fruit Open House at Cornell Orchards where they saw how the latest research can help them extend their harvest season, manage nutrients and try new crops. At the field day, growers toured high tunnels — unheated greenhouses that extend the harvest and improve the quality of bramble crops, as well as make it possible to grow crops that don’t normally overwinter in New York, such as figs and blackberries. High tunnels can also protect crops from late freezes such as the one that occurred last spring. Growers also viewed a low-tunnel production system that similarly protects crops from frost and allows earlier harvest of ever-bearing strawberries in spring while extending the season well into fall. Growers were also introduced to new berry crop possibilities, including juneberries, currants, gooseberries and elderberries. High tunnels extend the season and improve the quality of raspberry crops, and make it possible to grow crops such as figs and blackberries that don’t normally overwinter in New York. Larry and Christine Smart with their winning pumpkin. Photo by Rob Way. 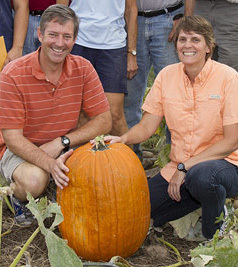 ‘Smart’ pumpkin growing wins contest, boosts scholarships [Cornell Chronicle 9/24/2012] – Larry (horticulture) and Christine (plant pathology) Smart won the New York State Agricultural Experiment Station’s first pumpkin growing contest. Their winning entry tipped the scales at 52.6 pounds. A twisted tale: Plant roots form helices as they encounter barriers [Cornell Chronicle 9/24/2012] – Using 3-D time-lapse imaging, Cornell physicists and plant biologists have discovered that certain roots, when faced with barriers like a patch of stiff dirt, form helical spring-like shapes. 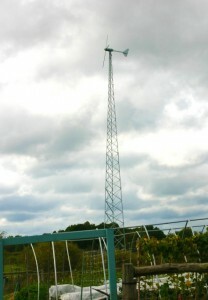 10KW wind turbine on Cross Island Farm, Wellesley Island, N.Y.
From Violet Stone, Cornell Small Farm Program. Have you been considering transitioning from fossil fuels to renewable energy on your farm or homestead? The farmers in the 2012 “Light Up the Farm with Sustainable Energy” field day series are eager to show you how. The farms in our 2012 series are producing a wide range of products spanning vegetables, poultry, milk, eggs, honey, garlic, koi fish, and even lemons and figs! And they are all doing so using sustainable energy. Solar thermal, solar photovoltaic, wind turbines, radiant heat, and a variety of other ecological production techniques are empowering these farms to stabilize their energy bills into the future and conserve resources for the next generation. During these farmer-led, inspiring tours, you’ll learn about how to decide what renewable energy source is right for you; grants and loans available for financing; installers that work with farmers; and other sustainable production techniques. Program details, maps and registration information for all three field days. 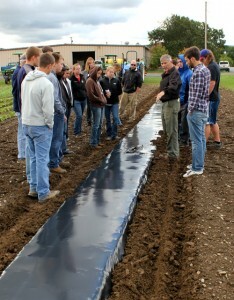 Students inspect newly laid plastic mulch. 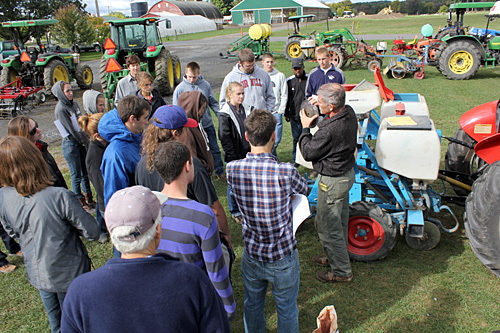 Students in Steve Reiners’ and Robin Bellinder’s Principles of Vegetable Production class (HORT 3500) spent Saturday morning at the Homer C. Thompson Vegetable Research Farm in Freeville, N.Y., learning the ins and outs of more than a dozen tillage, planting and cultivation implements. Farm manager Steve McKay explained the fine points of how each piece of equipment works, while field assistant Rick Randolph helped the students try their hand at operating the equipment in the field. HORT 3500 focuses on commercial vegetable production from variety selection to postharvest. 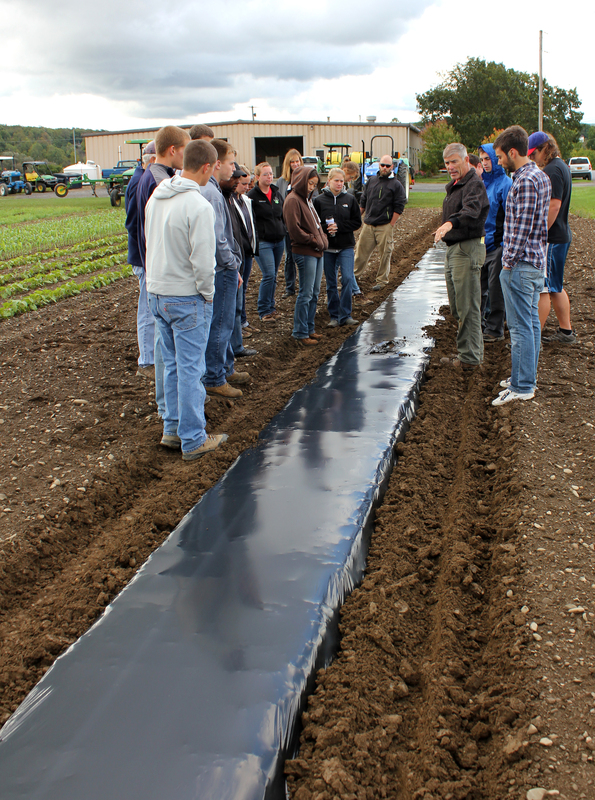 Students learn about crop physiology and culture, soil and pest management, stand establishment, marketing, and history of production, and take field trips to large-scale conventional, small, diversified, and organic farms. Farm manager Steve McKay explains planter seed plate selection. 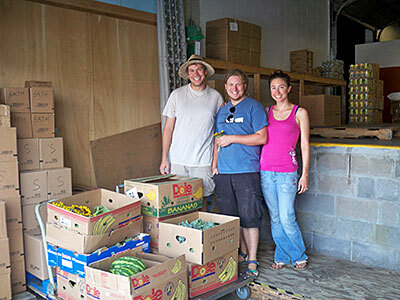 Ag station student group turns garden harvest into food donations [Cornell Chronicle 9/14/2012] – Student Association of the Geneva Experiment Station donates about 40 bushels of produce from their garden to the food pantry at the Geneva Center of Concern. Many faculty members stepped in to supplement the students’ donations with produce from their own field experiments. Thomas Björkman, Ph.D. ’87, and Stephen Reiners, associate professors of horticultural sciences, provided sweet corn and green beans, respectively. Terence Robinson, professor of horticultural sciences, contributed peaches; Chris Smart, associate professor of plant pathology, contributed tomatoes. Please Explain: What Organic Labels Mean [Leonard Lopate Show 9/14/2012] – Thomas Bjorkman, professor of horticulture at Cornell’s New York State Agricultural Experiment Station in Geneva, NY, and Dr. Urvashi Rangan, Director, Consumer Safety and Sustainability Group at Consumer Reports, discuss the issues on WNYC radio. New apple varieties being developed in Geneva [Rochester Democrat and Chronicle 9/14/2012] – When Susan Brown, associate chair in the Department of Horticulture, breeds apples, she has two audiences in mind: consumers and growers. She selected traits in New York 1 and New York 2 — two new Cornell-developed varieties poised to hit the market in 2014 or 2015 — that would satisfy both. Brown also explains what it takes to develop a new apple variety in the author’s blog post And you thought baking apple pie was hard. Try breeding an apple. And the Cornell apple breeding program was also featured in A Bittersweet Bite in the Fall issue of Life in the Finger Lakes, and she talks with Fruit Grower News on YouTube. The Art of Apples – [Bon Appetit 9/6/2012] – Artist Jessica Rath sculpts apples from the USDA’s Plant Genetics Resources Unit and photographs silhouettes of Susan Brown’s apple tree crosses. 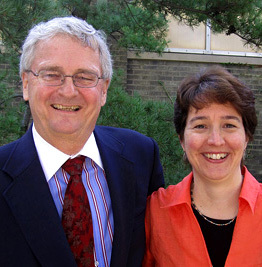 ITHACA, NY: Cornell University plant pathologist George Hudler began Branching Out in 1994 as a newsletter providing plant health-care professionals with “hot off the press” information about insects and diseases on woody plants in New York landscapes. Each issue included a feature article providing in-depth discussions of individual pests and pathogens. Branching Out was written by Dailey O’Brien with contributions by colleagues Dan Gilrein, George Hudler, and other knowledgeable professionals. Now those 18 years of feature articles have been updated and compiled in Branching Out: Features from the Past for the Future, a nearly 300-page book with over 700 color photos. For landscape, nursery, and Christmas tree professionals and other Branching Out aficionados, no more need to shuffle through old newsletters tucked into an overfull file cabinet—the vital information for coping with the most important issues readers are likely to face will be at their fingertips. Branching Out explores and explains the integrated pest management (IPM) concepts central to the range of tactics for dealing with a pest—as well as conditions that look like a pest caused it, but didn’t. From “Hickory Hiccups” to “Thousand Cankers Disease” to “Mulch Maladies”: whether it’s diseases, arthropods, or cultural conditions like drought, herbicide injury, or soil compaction, Branching Out’s feature article compendium has it covered. First-rate color photos and a well-designed index provide both ease of use and the superlative identification guidance essential for good IPM. Branching Out: Features from the Past for the Future is is available from Branching Out, Department of Plant Pathology and Plant-Microbe Biology, Cornell University, 334 Plant Science Building, Ithaca, NY 14853. Cost: $30; checks made out to Cornell University.